No. 14 Rush Truck Centers/Mobil 1 Ford Mustang driver Clint Bowyer believes the 2019 Monster Energy NASCAR Cup Series season will be one of change for competitors, fans, teams and corporate partners. The sport’s normal breakneck pace, combined with new leadership and a daring new rules package designed to boost competition should dominate headlines throughout the year. But one thing will remain the same according to the Stewart-Haas Racing (SHR) driver who logged two victories, nine top-five finishes and 16 top-10s in 2018. Las Vegas odds already make Bowyer one of the top four favorites to capture the sport’s most prestigious race. His Roush-Yates-powered Mustang, combined with Ford Performance expertise and the crew chief Mike Bugarewicz-led crew at SHR should keep him at the front of all the events of the 2019 Speedweeks. Bowyer’s Speedweeks kicks off Sunday when he drives the No. 14 Mobil 1 Ford Mustang in the 75-lap Advanced Auto Parts Clash – his first Clash appearance since 2016. NASCAR officials in October announced two baseline rules packages for the 2019 season, making a move to bolster competition with enhanced aerodynamic and engine configurations. The different packages are tailored to the specific tracks on the Cup Series circuit, with a combination of a smaller tapered spacer to reduce engine horsepower to a target goal of 550 – from 750 – and aero ducts to foster tighter racing on a majority of speedways measuring longer than 1 mile. Both features will be in place for 17 of the 36 races, except for the Daytona 500, which will run with traditional restrictor-plate rules. Five other races will be run with the smaller spacer, but without ducts. It’s fitting Bowyer’s No. 14 Ford begins the season carrying the Rush Truck Centers and Mobil 1 paint schemes at Daytona. Rush Truck Centers has been the primary partner for the No. 14 team since Bowyer arrived at SHR in 2017 and has been with the organization since 2010. The Texas-based company has used Bowyer and the team to appeal to NASCAR fans as one way to recruit the technicians it needs to operate the largest network of commercial truck and bus dealerships in the country, with locations in 22 states. According to Rush Truck Centers, the trucking industry is expected to need 200,000 diesel technicians over the next 10 years to keep up with maintenance demands. Rush Truck Centers wants to make NASCAR fans aware of these opportunities and knows that, with Bowyer’s background, he is the right guy to help get the message out. Mobil 1 isn’t just the world’s leading synthetic motor oil brand, it also provides the entire SHR team with leading lubricant technology, ensuring that all SHR Mustangs have a competitive edge over the competition on the track. 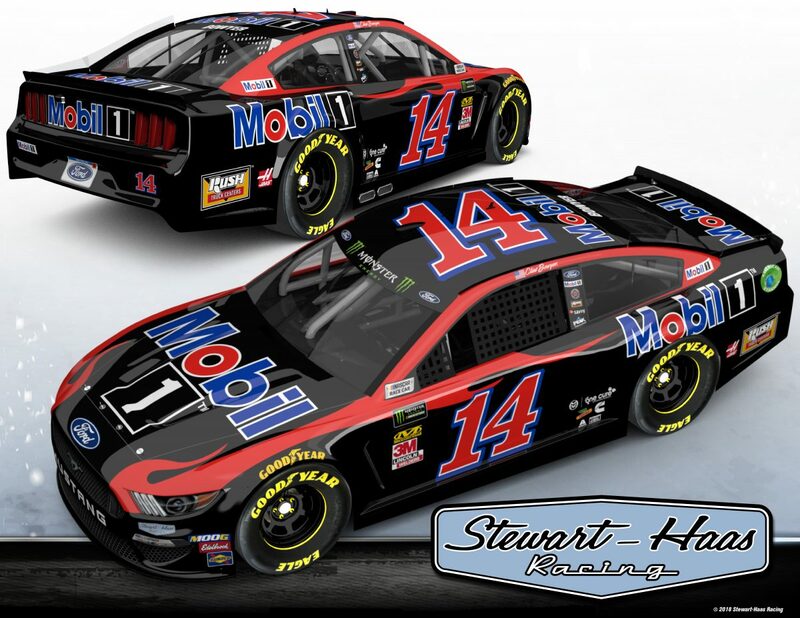 In its 17th consecutive season as the “Official Motor Oil of NASCAR,” Mobil 1 is used by more than 50 percent of teams throughout NASCAR’s top three series. “I know you hear drivers talk about the importance of corporate partners all the time and that’s true, but at SHR, they are a key to our success on the track,” Bowyer said. “Mobil 1 is such a source of technology under the hood and it’s a real advantage for us. Our success illustrates the technological advantages Mobil 1 is giving us on the track every single week. Bowyer hopes he can celebrate with Rush Truck Centers and Mobil 1 many times in 2019, and none would be bigger than the season-opening Daytona 500. Your thoughts on running a Mustang in 2019?